Hi friends! I hope you're having a wonderful day! We took it pretty easy today. We did go to a birthday party for one of Brady's friends and that was very fun! She's a special one to me, the little girl that made Brady want to start going to school. Here's a card I made yesterday for National Scrapbooking Day. Ok, it's not a scrapbook page but it will have to do. It's the only thing I got done. We had a really busy day. I made this for two challenges. First is the Paper Smooches NSD challenge to use only card stock (no patterned paper) on your project. Secondly, the Moxie Fab World Spectacular Spectacles challenge, to used glasses or spectacles on a card. I pulled out Paper Smooches Geometric to create the background of the grey paper using watermark ink. Then I used the same set to make the green chevron. 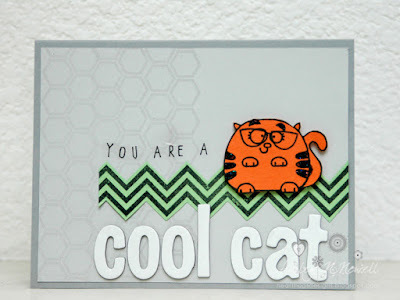 The cool cat is from Chubby Chums and the glasses are from Chubby Chums Pals. I added some letter stickers and Stickles for finish. HA! GOT IT! ;) LOVE this card!!!! Super cute, Ashley! Great job with the Moxie Fab Spectacular Spectacles challenge! !